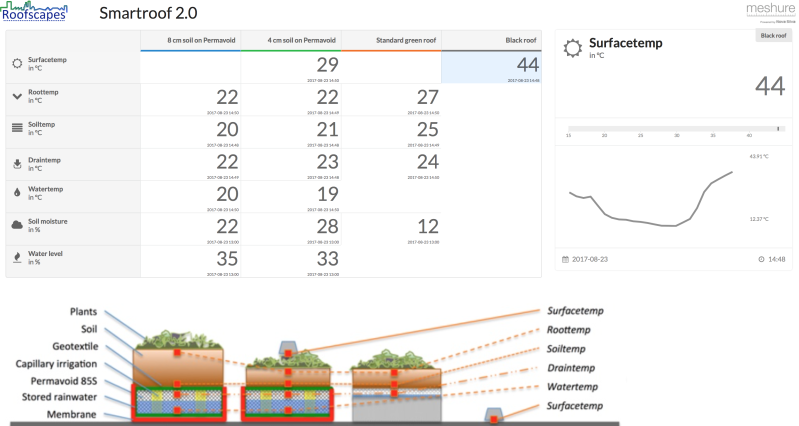 Fourteen independent wireless AiroSensor temperature sensors were installed to measure the temperature on, in, and under the plants on the black rooftop (this was done independently of the research project being conducted by KWR Water into the exact balance between water and energy on blue-green roofs). 23 August was a lovely summer's day in Amsterdam – until the clouds made an appearance at 4:00 PM – with an average temperature of 26 degrees forecast. At Project Smartroof, we measured a temperature of 44 degrees at the hottest moment of the day (2:51 PM.) on the black roof coverings, yet the temperature of the plants remained a consistent 29 degrees. 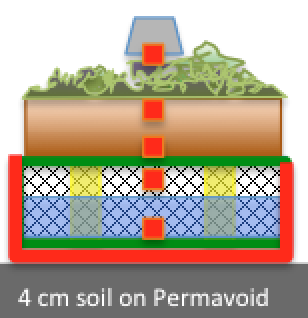 An even more striking fact is that the temperature of the substrate above the Permavoid Blue-Green system remained between 20 and 22 degrees, while the substrate above the standard green-roof system rose to between 25 and 27 degrees. Although this is only a snapshot and not an official study, it does illustrate that the presence of water and plants (a blue-green system) significantly reduces roof temperatures and prevents heat from entering the building through the roof. As a result, the air-conditioning system could soon be languishing in the corner, watching the plants steal its job! As well as using no energy, the system extracts CO2 from the atmosphere, so it actually absorbs carbon rather than emitting it. It's all done on the same roof, simply by slightly adjusting the set-up. Screen-print of the online dashboard of Project Smartroof 2.0, which conveniently displays all of the data provided by the wireless temperature and substrate-moisture sensors. This dashboard was created by Nova Silva, a specialist in reading out online sensor systems and creating convenient displays of the data collected to give clear insight at a single glance.